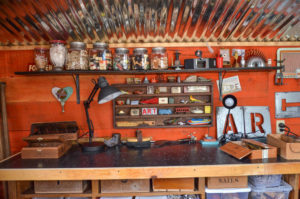 Bellingham Artist Karin Mueller earned first place in the construction & remodeling category in the 2017 national reuse contest hosted by The Reuse People. This is the second year in a row that a Bellingham resident has placed in the contest. Each year, people around the country are encouraged to submit photos of their home DIY projects that use reused and recycled materials. Entries are accepted into two categories, construction & remodeling and art & furniture. The Reuse People then select the national first, second, and third place winners of each category. To go along with the free standing shelving, a long workbench was built to cover the whole back wall. It was constructed from a used kitchen cupboard cut in half and then topped with an old door. The ceiling was sided with corrugated metal and the walls with salvaged siding. Interestingly, Mueller stocks the studio with additional salvaged materials, antiques, and various bits for use in her artworks. As a first place winner, Mueller won a $1,000 gift certificate to The RE Store. She has already spent some of her winnings to purchase Revision Division furnishings. Built in house at The RE Store, Revision Division furnishings are constructed from 100% reclaimed materials. “We came in looking for a table, and there it was. It was just perfect”, says Mueller referencing the rusted steel and stained lumber table that now fills her dining room. To see the rest of 2017 Reuse Contest winners, visit The Reuse People website.